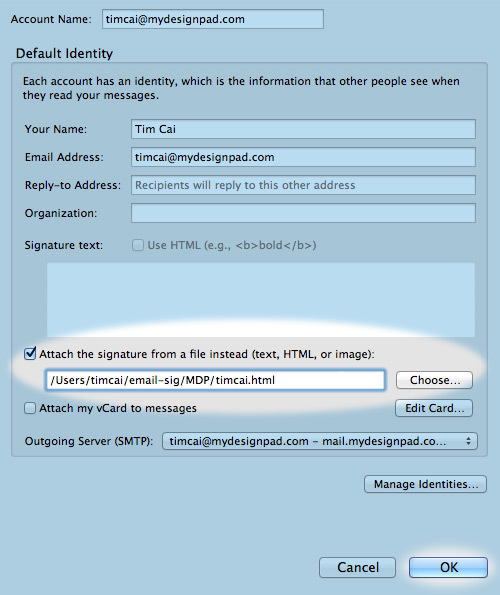 Installing a HTML email signature in Mozilla Thunderbird is easy but creating a complex signature with remote images and links is hard. In Section 1, we will go over how to write up the HTML codes for the signature with remote images and links. If you already have the HTML codes written up for your email signature, go straight to Section 2 for instructions on how to get it installed. If you don’t know anything about HTML coding or just don’t have the time to deal with it, you may consider hiring MYDESIGNPAD to create the HTML signature for you. Please visit www.mydesignpad.com/htmlsignature/ for more info. A web hosting provider to host your images. I use A Small Orange: Homegrown Hosting. If you don’t have one, try using Dropbox to host your images for free. A HTML editor (Coda, Adobe Dreamweaver CS6 for Mac, BBEdit) to write up your codes. I use personally use Coda. In today’s world, we often send and receive emails across a number of different platforms: desktop computers, laptops, tablets and smart phones. So it is important to consider how and where the recipients view their emails. 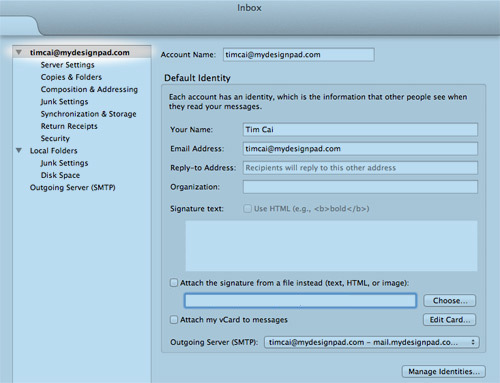 If most of your recipients view emails on a computer, there is more flexibility on how big or small you decide to make your signature block. If your recipients view emails on their mobile phones often than you should keep the width of your HTML signature under 320 pixels wide to be safe. Today, most modern mobile devices have a default width of 640 pixels. Rule of thumb, better to limit the width of your signature design so that it would look great on the computer as well as on mobile phones. View Sample Signatures that I have created for my clients. Decide what sort of information you want to display on your signature. 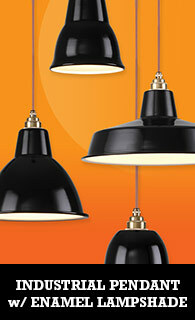 For this demonstration, we’ll use first/last name, title, email, company name and logo and some links. Here is my signature design. You may use it as a starting point. To see the HTML codes, find “View Source” in your browser menu. NOTE: For Outlook 2011, keep your design width under 320 pixels to prevent having to manually adjust the width of your signature each time you compose new email. Before we begin, here are some basic but important notes to keep in mind as you design your signature. One major obstacle in designing HTML e-mail templates is that there are literally dozens of different e-mail clients out there (most if not all canâ€™t handle CSS and HTML like our internet browsers can) so you have to keep your design and codes as simple and straight forward as possible. Use absolute URLs. Relative paths wonâ€™t work for an e-mail signature. So all your links need to be absolute URLs. Since we want the email signature to load quickly, make sure to optimize your image with Adobe Photoshop by doing a “Save for Web.” Upload your image to the web server taking note of the public path. The public path (absolute URL) should look something like this: http://www.yourdomain.com/images/logo.gif. Copy and insert it into your HTML codes. If you don’t know how to work with a web server or don’t have one, try Dropbox. It is a great alternative and it is free. Once you have your Dropbox account set up, you can create public links to your image file. Once you have your email signature designed and laid out just as you like, save the file to your Desktop and call it “signature.html.” In my case, I named my file timcai.html. Open the “signature.html” file that you’ve just created in Safari or Firefox (not tested with other browsers). Save the HTML file in a folder that you will not delete or forget about on your hard drive. 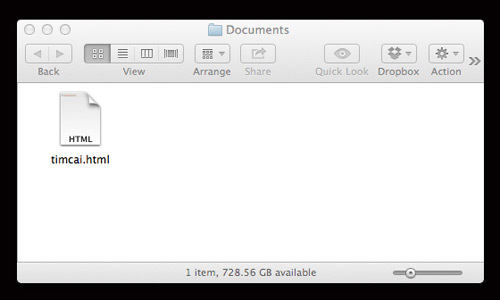 For example: I put my HTML file inside my Documents folder. Open Thunderbird. Select Tools and Account Settings from the program’s menu. Click on your account’s email address on the top left if not already. On the first panel that opens up on the right, check the “Attach the signature from a file instead (text, HTML, or image)” To the right, click Choose, browse your hard drive for your signature file and attach it by pressing Open. Click OK in the Account Settings panel to save your changes. 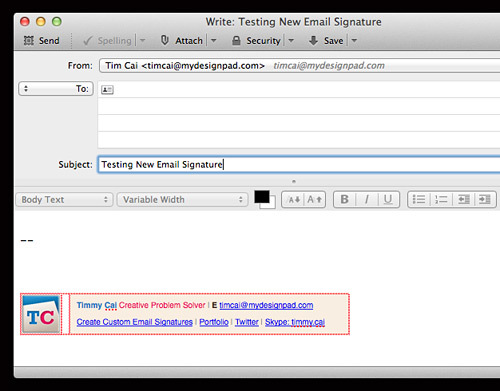 Test your signature by sending an email to another email address. Checking that your signature works before using it with your contacts is a sensible safeguard. I use a different method for including my signature graphic, inline base64. 1) Change default graphic paste format from png to jpg. A few clients may not display png. In Config Editor, change the value of clipboard.paste_image_type to “0”. Restart TB.
. Add that to your signature file. Alternately, there are several image->base64 converter web apps. They may only generate the base64 code, so add the HTML tags. This technique is perhaps best suited to small images, or your signature file will be full mostly of base64 encoding. The advantage of this method is that the image is not an attachment and should show up in modern clients. And, linking to external images often requires recipient approval for them to appear. Maybe the above comment has a valid method, but i prefer the one in the article. Almost every recipient these days accepts external images! Tom. As I may also agree with you, it is unfortunate to say that there is still a significant about of people who use email programs that cannot handle/accept external remote images or at least not very well. One of them being Outlook. Security being their reasoning. How can the double dash be deleted from Thunderbird default settings? For removing the separator use the config editor to change mail.identity.default.suppress_signature_separator from false to true. ( from http://kb.mozillazine.org/Thunderbird_:_FAQs_:_Signatures ). I followed your guide here and I am having one problem. When I shrink the browser down (any browser) or email client (in this case, apple mail) the text doesn’t stay aligned. The words move with the shrinking of the browser. How can I fix this? When i am trying to enter the Html signature it always say Sending of message failed. There was an error attaching view. Please check if you have access to the file. Please assist me on this ASAP. Somebody knows why base64 converted images does not shown in emails on Mac+Outlook? Thank you for sharing the post but can you provide html code (i don’t know coding). I tried many things but its not coming good. Outlook 2007 and 2013 have a rendering engine different and NOT show any image that is not added as attachment and insert with cid. But those embedded images can be created only by a webserver and and email service sender. I use Thunderbird as a text editor. Appearances (choice) are not perfect but TB do the job. Mail client are filtering content, and it’s diffcult to know if the mail will be read in the good way. Always use alternative … such as alt text for img. STOP said “PC” for windows. A Mac is a PC (since “intel inside”). Yes, you are right. It should be referred as Windows instead of PC nowadays unlike in the past where Mac computers didn’t use intel chips. Thank you for your comment.